This railway is closed and is now the Strathspey Way. A preserved line of the same name runs between Aviemore and Broomhill along a portion of the former Inverness and Perth Junction Railway. Craigellachie, Speyside platform, looking East. This line runs by the River Spey from Boat of Garten to Craigellachie. The line served a number of distilleries. From Boat of Garten to Craigellachie. The Railway made use of this Highland Railway station on the Inverness and Perth Junction Railway. See the Highland Railway entry. HR and GNSR tracks ran separately to Broomhill Junction where they diverged. The Strathspey Railway divereged from the Inverness and Perth Railway at this location. This was a single platform station. The platform and building remain. This was a halt with a short concrete platform. The station building (derelict) and platforms remain. A number of cottages have been recently converted into houses. The platform remains, and the building is now a house. This branch ran south from the main line, from a junction facing west. This station was closed at an early date. This station's platform remains. The timber building has gone. There have been two Advie stations as the station was re-located. The station platform and building remain. The station building and platform remain. This station is within the grounds of a distillery. The station's platforms and station buildings remain. The station was originally known as 'Dalbeallie' (with thanks to K. Fenwick). The station building, partly infilled platforms, goods yard and some lengths of rail within the nearby distillery remain here. The timber platform remains here. The left view shows the station as it is today. This station had two platforms, the Westbound one has been removed. Off to the left of the view is the goods shed, which is shown in the right hand photograph. The view looks towards Aviemore. The station building was of the same style as that at Insch on the Great North of Scotland Railway. This view looks East towards Dufftown. The view shows the Speyside platform. Off to the left there were two further platforms for the route to Elgin. These have been removed in road improvements. To the left there were a number of sidings and a goods shed. This area is now a car park. 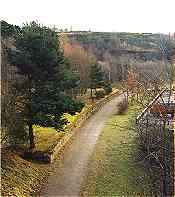 This was the junction for the Morayshire Railway. An end-on junction was made here with the Keith and Dufftown Railway.